Well I did it! 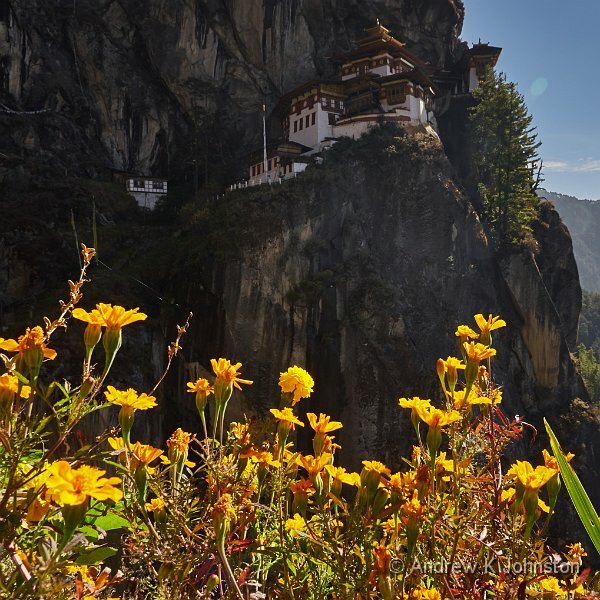 This is Paro Taktsang, otherwise known as the Tiger’s Nest, a monastery founded in the 15th Century which sits on a cliff edge over 1000m above the floor of the Paro Valley. Apart from the obvious visual attractions, this particularly appealed to me as it’s one of the main inspirations for Ra’s Al Ghul’s lair in Batman Begins. I’ve stood where that was filmed (in Iceland, about 150′ above sea level and about 100 yards from the car park :)), and wanted to visit the "real thing". The walk up to the Tiger’s Nest is hard work, but really worth it. Horses take you up about 400m, where there’s a convenient cafe at a viewpoint. You then have to walk up another 500m to the top viewpoint, down steps carved into the cliffside about 200m, across a tiny bridge and up the same again on the other side to reach the monastery. Going back is the reverse, so there’s another 200m ascent before you reach the high point for the last time. Think of doing Snowdon one and a half times, but starting at twice the height of Ben Nevis! My knees hold up reasonably well, and afterwards, by the time I’ve walked all the way down (no help from the horses in that direction), our guides have organised another excellent al fresco meal under the pine trees. Very pleasant. In the afternoon the only thing we’re good for is a bit of shopping in Paro town centre, and another visit to it’s nice little coffee and cake shop. The "last supper" is uproarious, and emphasises what a great group this has been. Up early in the morning for the flight back to Kathmandu. This entry was posted in Bhutan Travel Blog, Travel. Bookmark the permalink.